I think everyone is wondering how to make extra money on the side. I mean, who couldn't use some extra dough? 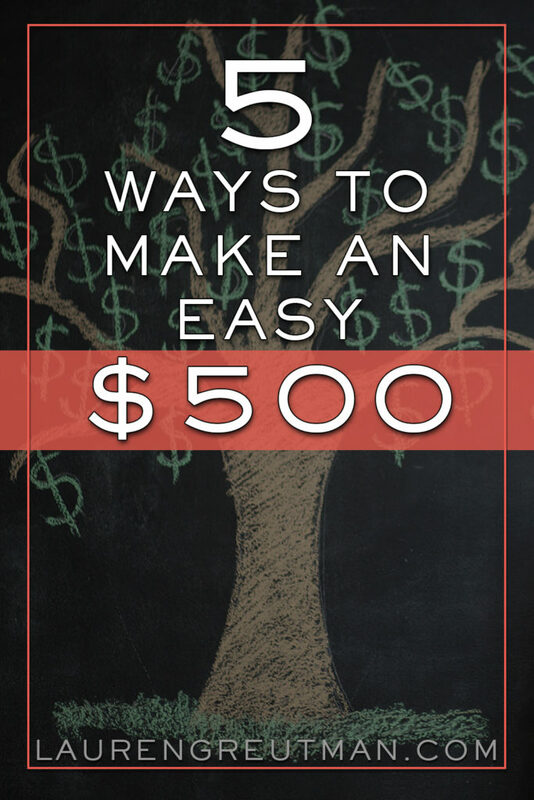 If you have a little free time and some drive to build that emergency fund, pay off more debt, or save up for a vacation, here are 5 ways you can make an extra $500 on the side. Here's a list of 10 to get you started. This is something you or your spouse can do while you're relaxing on the couch in the evening. They all have different pay scales, so find the ones that you feel give you the most value. Of that list, here are my 5 Favorite survey sites. Chime Bank is an online-only bank that will give you up to $500 a year in Cash-back rewards! They have a ‘keep the change' savings program that rewards you with free bonus money based on how much gets put in your savings account! If you're interested, here is a full review of their services. Buying items specifically for the purpose of reselling them can be extremely lucrative. Some people resell as a full-time job! You can resell on eBay, Amazon, Craigslist, local buy/sell groups. Find your niche and get started! Here's an article that covers a few more aspects of reselling. Also, as part of The Financial Renovation eCourse, I go into much, much more detail on reselling. Weddings are for the most part seasonal, but you can charge a pretty penny for running a photo booth at any event. Get a plastic tub full of props, a backdrop, a camera (or your smartphone) and you're good to go! You can upload them right to social media with a hashtag (#soandsotogetherforever) or hook up a photo printer and give people color prints on the spot. You can factor the ink and paper costs into the price. You can even get certified to up your credibility. Sites like DogVacay.com hire pet sitters for overnight and daytime pet sitting services. Or, you can try and start your own thing. If you want to make extra money on the side, your only limitation is your imagination! There are TONS of ways to bring in a little something extra each month!